Sometimes, the business world makes you feel like you’re stuck on a roller coaster. My previous business partner, Jim, and I had more ups and downs than I care to remember as we worked to build our company from a little two-way radio business to a cellular network that spanned much of the West. This experience taught me that, in business, you often need more than just a good head on your shoulders to be successful. There were three lucky and well-timed events that happened over the course of a decade which resulted in a successful business outcome for us. It’s a wild ride, so buckle up! 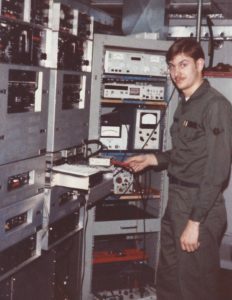 Steve’s time in the United States Air Force gave him many skills he would use later in his career. Timing event #1: In the mid-1990s, the communications market was changing rapidly and the tower site industry was experiencing a major Wall Street roll-up (a phenomenon in which a company grows by acquiring rivals in their respective industries). There were companies like American Tower Corporation that were going from being an initial public offering to a billion-dollar powerhouse overnight. They would run around the country spending that money by gobbling up little mom-and-pop tower site companies like ours. As more companies entered the game, it became very competitive and growth-focused. The primary goal was to acquire the most tower sites; factors such as cash flow and viability were negligible. At the time, we owned multiple leases on tower sites throughout the West. These quickly became hot commodities once the roll-up began. Jim and I were able to sell the leases on three primary sites for more than 10 times the annual cash flow. This gave us the cash we needed for our next move: the FCC Spectrum auctions. Timing event #2: Since its conception in 1934, the Federal Communications Commission (FCC) has regulated the use of the radio frequency spectrum by licensing it as a service to the public. In the late 1990s, our money-hungry government figured out a way to turn the FCC into a profit center by auctioning off the spectrum to the highest bidder. Jim and I dedicated ourselves to finding a way to make it profitable for us but also found it to be a fascinating process. We rented a separate office for the sole purpose of participating in the auctions and filled rows of filing cabinets with our research — not just about the markets we planned to buy in, but literally the entire United States. We participated in these auctions for years. During this time, we acquired a significant portion of the 800MHz band, which would soon prove to be a wise investment. In the first auction, we were able to secure several blocks of licenses and then spent the next year negotiating with Nextel to sell the spectrum to them at about twice what we paid for it. In the second auction, we did it again and learned a lot about what Nextel was willing to do and not do. By the third auction, our strategy changed to purchasing and keeping licenses for our own digital cellular network. One stipulation when buying this amount of spectrum is that you must certify to the FCC that you made it not just operational, but in-use by the public before the end of one year or you lose it. We had just purchased licenses over eight western states, so our small two-way radio company had some work to do. After a few grueling months, we were able to meet the license requirements in every market and actively sold our service to Nevada, eastern Washington, Oregon, and parts of Idaho. Although it was a proud moment for us and a fun accomplishment to build out a digital cellular system with this much of a footprint, our real game was forcing Nextel to buy our spectrum again, but at a premium this time because we had so much of it in the markets that they needed. Along the way, Nextel legally challenged the validity of our licenses. They thought they could acquire our spectrum by proving that our system did not meet the stringent requirements put in place by the FCC. One of those requirements was Local Number Portability (LNP), which gives customers the ability to retain their phone number if they switch to another service provider. The practice was barely coming into use at that time, even by the big carriers like AT&T. We purchased our digital system from Motorola with the understanding that it had to be LNP compliant. It seemed to have all the right pieces, but it turned out to not be LNP compliant. As you can imagine, it is hard to force a large company like Motorola to move quickly. Jim was spending a huge amount of time and money on attorneys trying to force Motorola to get the system working as required. Meanwhile, I was working endless hours with Motorola engineers from all over the world. Although we were running on fumes, it finally worked and our system was fully LNP compliant. But we weren’t out of the woods yet: another compliance regulation we had to satisfy was called E911, which requires that your phone is automatically located when making an emergency 911 call. This one took a lot of midnight oil, the last of our cash, and an amazing engineer from Lubbock, Texas, but we made it happen. Wasn’t Nextel surprised when we filed our E911 compliance with the FCC before they had. Little companies rock! Finally, we were back to working on how to sell our licenses to Nextel when things got even more complicated. Nextel had been acquired by Sprint and those two companies were going through internal upheavals of direction and culture. Sprint personnel began participating in the negotiations and ramped up the heat, challenging our licenses and trying to put us out of business while at the same time negotiating to buy our company. Jim was constantly flying back and forth to Washington, D.C. for hearings with the FCC and discussions with Sprint/Nextel. We were spending tens of thousands of dollars on attorneys and working both sides of the deal. Our attorney, Liz, did an amazing job fighting both battles at the same time. I remember one day when she testified in front of the FCC Commissioners defending our spectrum use and then literally walked across the street to negotiate with Sprint/Nextel on the sale terms. Timing event #3: In December 2006, after a ton of money and stress, the deal finally closed. At this point, our company was barely hanging in there. All our posturing for the sale was a big gamble; we could have just as easily busted. Sometimes in business you need a little luck — and timing. It took the next six months to complete the process and we finally closed the doors on our two-way radio company June 2007. As you may remember, by August 2007 the financial meltdown began. Had we not executed the sale of our business when we did, it would have undoubtedly imploded. Thankfully, it all worked out, despite the years of uncertainty, turmoil, and strategy. We were able to give our 20 employees generous severance packages, Jim and I bought a ranch, and I met my current business partner, Greg Hughes. The rest is history!